"Old School" is a collection that spans the ten years of the Alice Cooper Group and includes a whole host of goodies spread over four discs. This Special Edition is a condensed version of the original sold-out Old School: 1964–1974 super deluxe box set released in 2011. 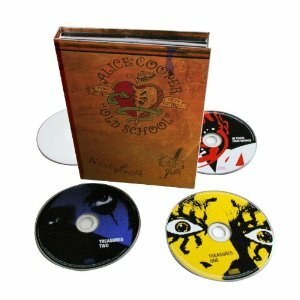 The set contains 4 discs containing demos, pre-production and rehearsal recordings of classic Alice Cooper tracks, radio spots, interview anecdotes, plus a full live show captured on the 1971 Killer tour – Live in St Louis – and a 60-page yearbook charting the career of Alice Cooper complete with many rare photos. While it may be a condensed version of the collection released last year, it's still an impressive collection, and at just under £25 it's extremely good value. It's great to hear some of the real classic Alice Cooper songs such as "I'm eighteen" or "Schools out" in their earliest forms. They're nowhere near as polished as the versions we're used to, but the songs themselves are still strong, it's just the recordings that show their age and the lack of modern production quality. The interviews and other extra bits are all great to hear too. It's a great collection for Alice Cooper fans, but only those who are really interested in hearing the old material - for many fans they'd be better off sticking to his normal studio albums or newer live recordings.